At Minnesota Leafless Gutters, we live and breathe gutters. Most homeowners, on the other hand, only think about their gutters only when there is a problem. The truth is that gutters play a vital part in keeping your home protected and dry. So, when investing in a new set of gutters, you should expect a gutter system that fits seamlessly to your home. That’s exactly what you get by investing in our seamless gutter installation services at Minnesota Leafless Gutters. You probably don’t want your new gutter system to stand out like a sore thumb. Instead, you’d prefer for the gutter system to blend in seamlessly with the overall look of your home. Lucky for you, our expert gutter installers offer more than 115 colors to choose from when trying to match your gutter system with your siding, soffit & fascia. Additionally, the downspouts are available in a variety of colors and materials as well. Many of our competitors don’t spend enough time ensuring that a new gutter system fits seamlessly to the home that they are working on. In turn, issues arise down the road. At Minnesota Leafless Gutters, we custom fit your new gutter system to your home so that it fits perfectly by utilizing industrial metal fabricating equipment during the installation. This ensures that your home stays protected and that you’ll be able to maximize the life expectancy of your new gutters. At Minnesota Leafless Gutters, we want our clients to feel like part of the family. Our staff is committed to providing fair and affordable pricing when it comes to our seamless gutter installation services. Additionally, for added peace of mind, we offer a free gutter inspection and consultation so that you are fully comfortable with this project before you commit to anything in writing. Our seamless gutter special utilizes the heaviest gauge sheet metal available on the market, which is available in aluminum, steel & copper gutter options. Our installation team never cuts corners with your seamless gutter installation. We’d prefer to focus on quality over quantity when it comes to serving our clients. Last, but not least, your seamless gutter project will be completed on time and there won’t be a mess left behind by our installation team. 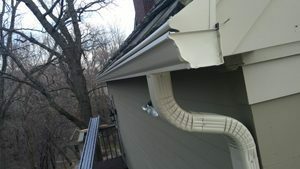 So, if the time has come for you to invest in a new gutter system for your home, it’s time for you to take advantage of the seamless gutter experience of our gutter experts at Minnesota Leafless Gutters. To request your free inspection and consultation today, give us a call at (612) 221-0362.